This week I wanted to come up with a very simple Holly Wreath craft for the Mums and Tots group that I co-run. This idea is exactly that, easy, and I actually ran out of materials on the morning because it was so popular. 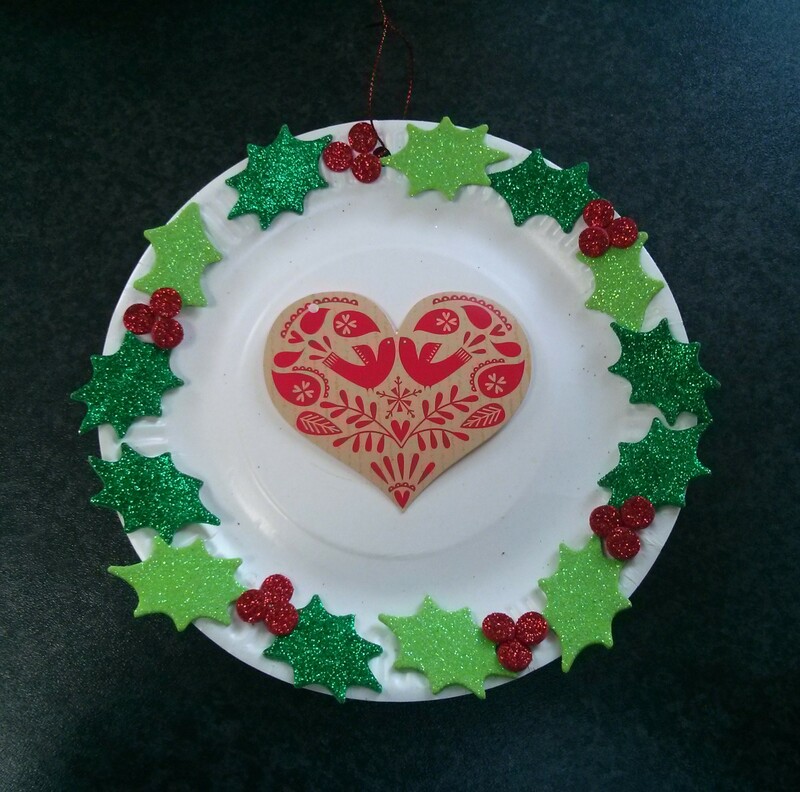 Gift tags – I found this heart shaped tag, plus a selection of circular tags for £1 reduced to 66p for 8 at Sainsbury’s but other tags would work, you could also print out a design and cut it out. Holly & Berry Glitter Foam Stickers – These are brilliant, I ordered three packs for £8.55 from Baker Ross which made around 25 plates, but if you making this for home you could just order one pack for £2.99. Sticky foam pads – You could also use glue or double sided sticky tape. Punch a hole in the edge of the paper plate. Untie the string or ribbon from your gift tag and tie this through the hole in the edge of the plate instead. You could use your own thread or ribbon if you prefer. Remove a sticky pad from the sheet and stick it onto the back of the gift tag. Peel off the second paper layer from the sticky pad and stick the tag in the centre of the paper plate. Using the holly and berry stickers create a design around the edge of the plate. The stickers have a paper backing which needs to be discarded but they have very good adhesive. Even the younger tots were able to peel them, I was very impressed with the quality. You’re done. It really is that simple and yet can look amazing. I did skimp a bit on the leaves with the example above as it was made to show the children what to do and I didn’t want to use up too many resources! Some of the designs the children came up with were stunning, from the abstract to the almost obsessively precise. You could put berries in a circle around the tag, you could lie the leaves so that they are in a sunburst pattern. The lovely thing about this craft has been that with so few resources and for such a young age range you can get some lovely results that you’d be proud to hang on your wall or your tree!